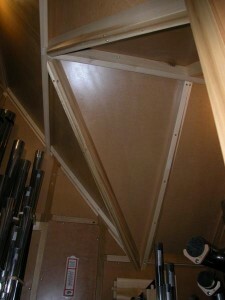 Complicated geometry of the Swell case's ceiling to follow Church's roof lines. Special pipe mitering to accommodate the unusual ceiling shapes. Winding system on the Great and Choir side of the organ. 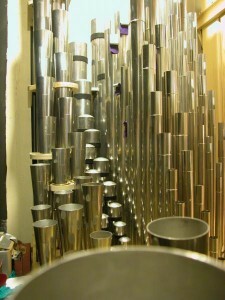 Pipes of the Great Organ looking over the Trompete resonators. A view from the console. The people at Hayes Barton United Methodist Church will always have a very special place in my heart and in our Company’s history. 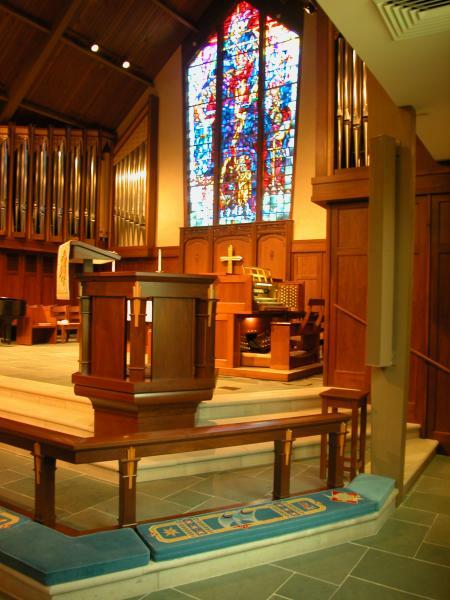 The Organ Committee, led by parishioner Mary Moss and Music Director Mike Trexler, fell in love with our instruments when they visited All Saints Episcopal Church in Atlanta, GA, our Opus 29 organ from 2003. Consultant Keith Shafer demonstrated the organ by playing the same pieces and hymns he played at other organs they were considering. Upon hearing or work at All Saints, the entire Committee had to be dragged away from the Church to hear work of other builders. Ultimately, every other organbuilder’s work they were considering had to meet our benchmark. The Church had an Austin Organ which was built in the 1970s. It was shoe-horned into every conceivable inch of space behind screens on either side of the choir. No pipes were visible. The Church was filled with a sea of red carpeting, the walls were soft, and the front of the Church sported a brick wall, the rectilinear mortar lines of which fought with the unusual angle-shaped stained glass window. The air-conditioning system sounded like a jet engine upon take-off. Contemporary worship expression had been accommodated by installation of all the latest equipment in the Fellowship Hall. The Pastoral and Music staff wisely understood that traditional worship has a very important and timeless place in our collective souls, and acknowledged that the Church building in its then form could not support it. 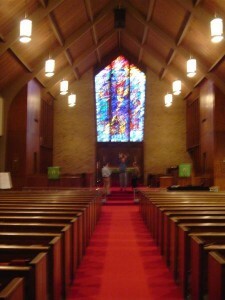 The Congregation undertook a tremendously successful campaign to completely re-design, re-outfit, and rebuild the Sanctuary. Their renovations, under the artistic eye of Consultant Terry Byrd Eason, and the critical ear of Acoustician Dana Kirkegaard, transformed the “1970’s show” into a holy space which encourages music making and easy understanding of the spoken word. The new Buzard Organ was the jewel in their crowning achievement. 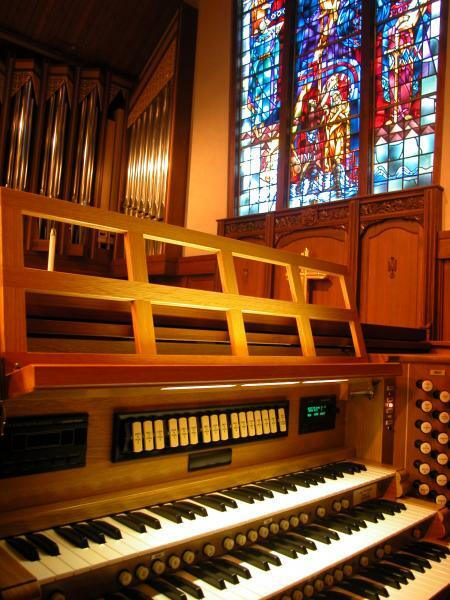 David Witt, who had been the Organist at a downtown United Methodist congregation, learned of Hayes Barton’s purchase of Buzard Opus 39 Organ, and was called to fill the recently vacated position of their Organist. In addition to being appointed Organist, David became the Church’s on-staff project manager for the Chancel renovations and coordination of those efforts with the new organ we were building. It is in great measure because of his diligence and attention to details that the Church’s renovations were completed without a hitch, that the new air conditioning system is absolutely quiet, and that the acoustical environment has been so dramatically improved. 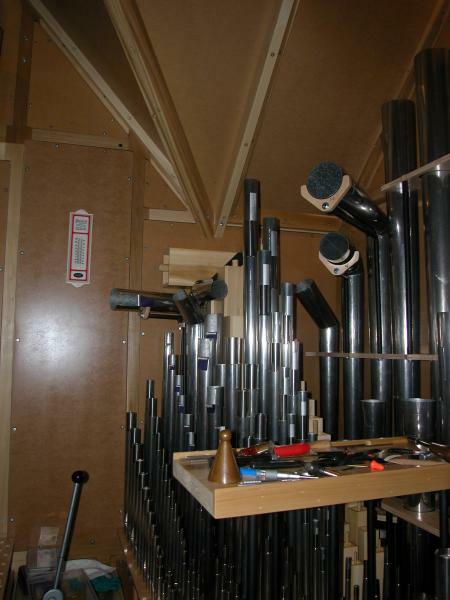 Our challenge was to design and install a rather large three manual organ into a space in which a much smaller instrument had called home – oh yes, and allow space on the first floor for a Sacristy, where the Pedal pipes had once been! 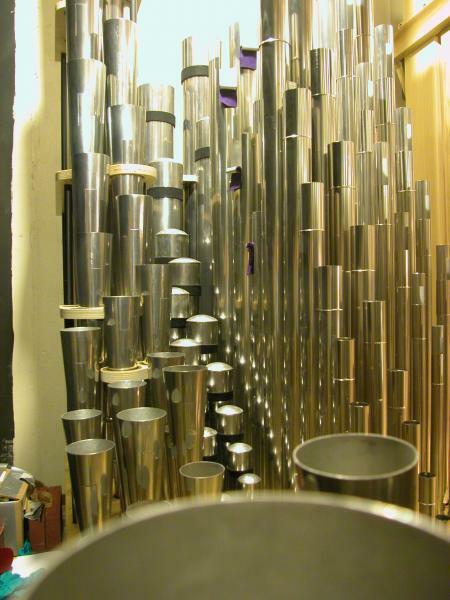 Although we were able to bargain for some of the Chancel’s “real estate,” and although the new organ’s large metal pipes were to be displayed in the façade, it was really up to Executive Vice-President and Chief Engineer Charles Eames to make the seemingly impossible happen. The old organ’s sound didn’t project well, due in part to the fact that its pipes were simply crammed up into the rafters and dormers within the chamber spaces, with no cases to reflect sound. The new instrument is actually installed in two free-standing cases, of very unusual shape, designed and built to follow and hug the roof lines of the complicated chamber areas. 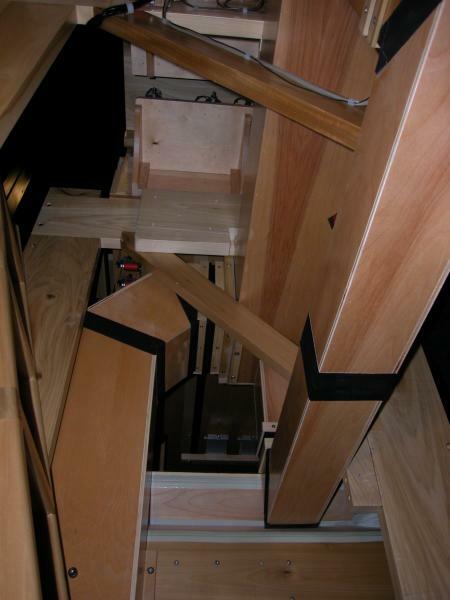 This was complicated planning and woodworking on a very large scale. When it all went into place, everything fit perfectly and in fact, we were able to draw the twin facades in a bit to occupy a bit less space than originally planned. The facades were designed by John-Paul Buzard to relate to the unusual shape of the central window. All of the angles present in the facades are in mathematical relation to the angles in the window and roof line. The façade toeboards gradually increase in thickness as their height increases, for example; each facade frame is roughly shaped like the window when viewed head-on. 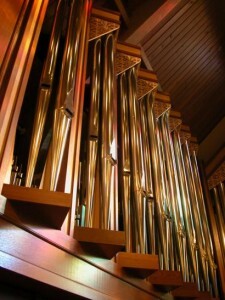 The organ is tonally typical of John-Paul Buzard’s instruments, which are accompanying organs that play literature extremely well. Yes, ours are “romantic” organs, in that the sounds are warm, smooth, and blending; our organs can easily provide several varieties of seamless crescendos and decrescendos; and there is a wide variety of orchestral colors in each. 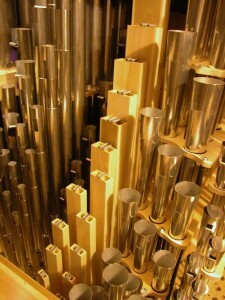 But because of our classic discipline, our classic notions about scaling, and the hierarchical relationships between stops and divisions (and the fact that our organs do have “divisions” in which certain families of sound, certain ensembles and tonal forces are “at home”), the organ plays all the literature musically and convincingly. 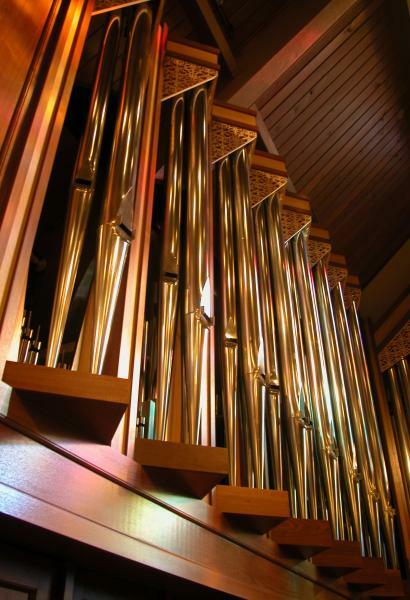 Without a truly classic discipline, pipe organs resort to expensive fun machines of over-voiced tonal colors, none of which has any real relationship to anything else. These organs may be said to have “ultimate flexibility” but to us, they border on the naïve. To this end, our mechanical systems all serve the tonal result. Everything works together and becomes greater than the sum of its parts. Electrically operated Slider & Pallet windchests provide mechanical reliability and encourage musical blend, eliminating leather while providing gentle wind to the pipes through their key channels. Beautifully made winding systems, including reservoirs with double gussets, are strong, silent, and provide copious wind at perfectly regulated pressures for musically solid response. Rock hard casework reflects sound out to the listeners. The pipes themselves are beautifully made, and well-supported in their racking. All the metal pipes are of high tin-content pipe metal, of generous thicknesses, so that the pipe walls do not vibrate with the pitches they are producing. Pipes are secured in pin-and-hook scallop traces from 4’ E and longer; all the reeds are secured in European reed racking systems. Tonal Director Brian K. Davis brings his years of experience in all styles of voicing to bear on each of our instruments. Everything blends and balances with each other; there can be no “wrong” registrations if one simply uses one’s ears and reads the names on the drawknobs. Our organs are elegant, but that elegance is not simply reserved for fancy console appointments which the organist and an Organ Committee see as their first impression. High quality runs throughout the entire instrument. 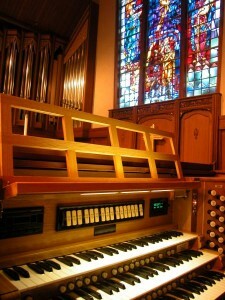 Consultant Keith Shafer, upon inspecting the completed organ, was not only impressed but surprised to discover that the same level of sophistication in the console’s woodworking and finishing was carried into the organ itself. Winding system, passage boards, ladders, rack boards – all receive multiple coats of clear lacquer sanded between coats – not orange shellac. I wish to thank everyone at the Church, including Senior Pastor Rick Clayton, Parish Administrator Russell Wilcox, Music Director Mike Trexler and Organist David Witt, as well as the fine Building staff led by Marshall Parker. Deepest thanks also to the staff of the Buzard Pipe Organ Builders whose tireless efforts have led to one of our finest instruments to date.